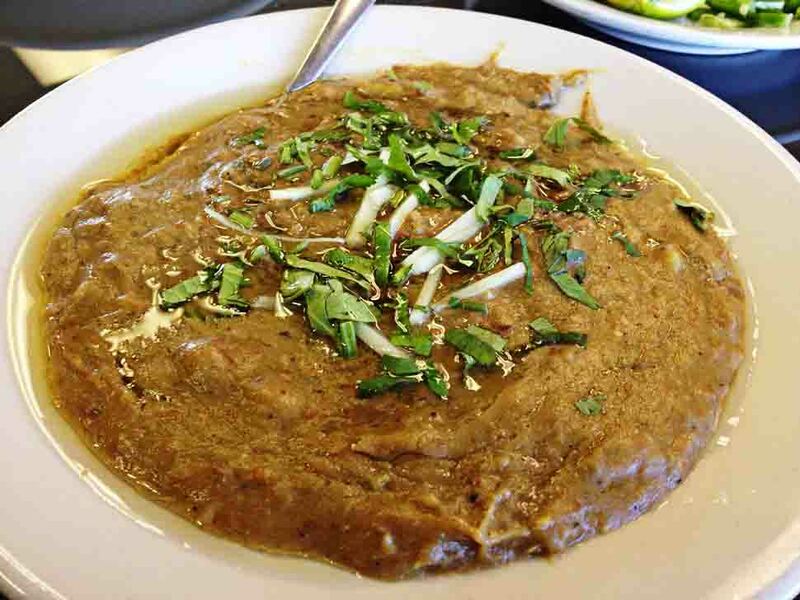 Haleem is a Pakistani delicacy, best enjoyed with a group. Why? Coz the amount of patience and efforts you put in this recipe is worth sharing with more than just one . I had cooked mine for a family get-together and it earned me a whole lot of brownie points. Soak all the dals and barley together overnight. Partly crush the wheat grains in a mortar and pestle and soak for 1 ½ hours. Put the lentils and grains, meat and bones, garlic, ginger and water in a large, heavy-based pot and bring to the boil. Simmer for around 2 hours, stirring occasionally. Remove the bones and continue to cook until the meat starts to fall apart (about another hour). Add the ghee, saffron colour (optional), fenugreek, coriander, cumin, chaat masala, chilli powder, turmeric and salt and cook for another hour, stirring regularly to help the ingredients break down and blend into each other. The stew will start to look very thick and sticky. Heat the vegetable oil in a frying pan and fry the onion until brown and caramelized. Add the onion (reserving ¼ cup) and garam masala to the stew. Cook for a further 15 minutes. While plating, garnish with the remaining fried onions, chaat masala, chilli, ginger, coriander and lemon. Serve with roti, naan or chapattis. P.S. : It took me 5 hours. But trust me, it was worth my efforts.